The value of pipe #186 is n/a points. 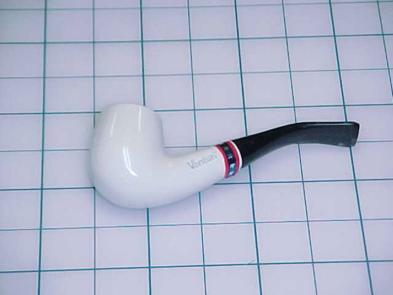 Baker Egerton noticed this unusual Venturi on eBay auction site being offered by Dusty Demsey. By the time I got to it, there was no time left to ask about the never-before-seen banded pipe, so I bid on it. After all, if it was a new model to the collection, it would be nice to have. I won the bidding and found when it was delivered that the foil band was apparently added by a previous owner and was not a production item. Therefore, nice as it is, it doesn't fit well into my collection and was added to the Pipes for Sale page. Mark Franklin snapped it up the day after it was listed. Much later I learned that this was a production item in the Spirit of '76 line.